While I enjoy a wide spectrum of design, wild and chaotic is not normally on my list. But Inson Dubois Wood‘s dramatic ode to Venice’s Carnevale really hit a chord. Rather like the circus performer who can keep all the plates spinning in his act, this room successfully maintains the momentum of a variety of vignettes. 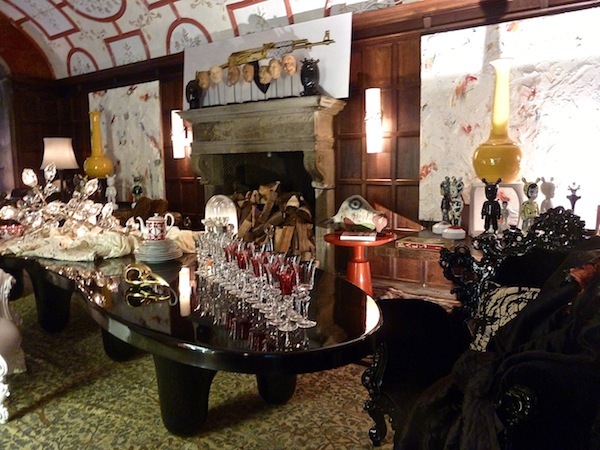 As one of the main first floor spaces, the architecture of the room was already noteworthy, but Wood embellished it even further for an over the top lavish exuberance worthy of Daphne Guinness and Alexander McQueen, both of whom Wood references with his design. 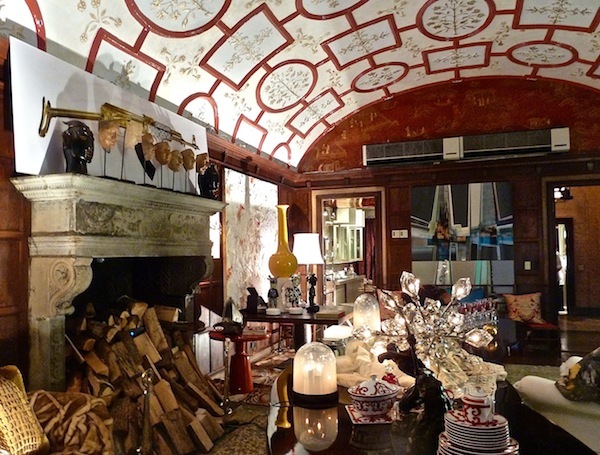 The bas relief elements of the ceiling are accented with gold dust Venetian plaster with a four layer hand waxed finish and red lacquer outline, then echoed by the hand painted lacquer Gracie paper on the walls at the ends. Working with sponsor Hermès, Wood chose one of my favorite porcelain patterns, the Balcon du Guadalquivir for his luxe tabletop. And how appropriate that he chose the Excess Chandelier, by designer Hervé van der Straeten, from Hermès sister company Saint-Louis. Since there was no ceiling outlet, I love how Wood just laid it on the table as if it had perhaps fallen during some over-zealous celebrating. From this angle you can also see the sculptural Wendell Castle Big Table, anchoring the center of the room with an almost amoebic life of its own. The Saint-Louis Excess stemware, also by van der Straeten, has a large imposing scale and rough luxe prismatic shape appropriate for both the space and concept. 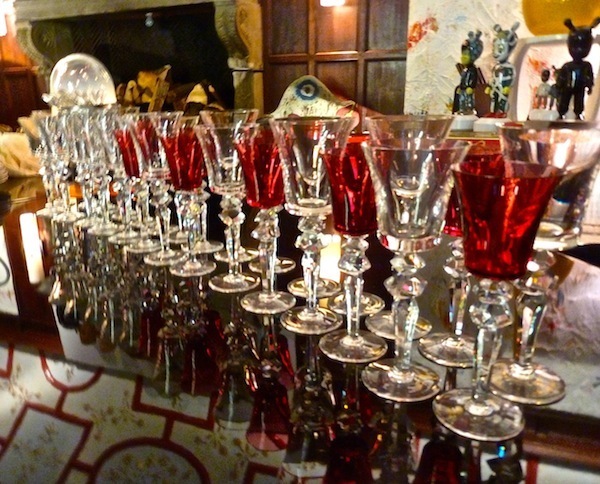 Continuing the thematic red, they are lined up ready for an army of revelers. 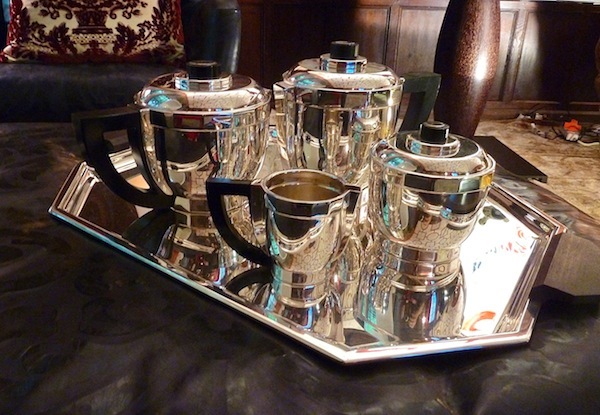 The third in the triumvirate of distinguished Hermès tabletop teams is Puiforcat, whose rosewood and silver plated Loya tea set (part of the Art Deco 1929 collection) sits waiting for a calm moment among the ruckus. Can’t you just imagine Daphne Guinness, decked out in some outrageous finery, sitting amid the cacophony with a cuppa, perhaps in the privacy of the regal Showtime Poltrona chair by Spanish designer Jaime Hayon? 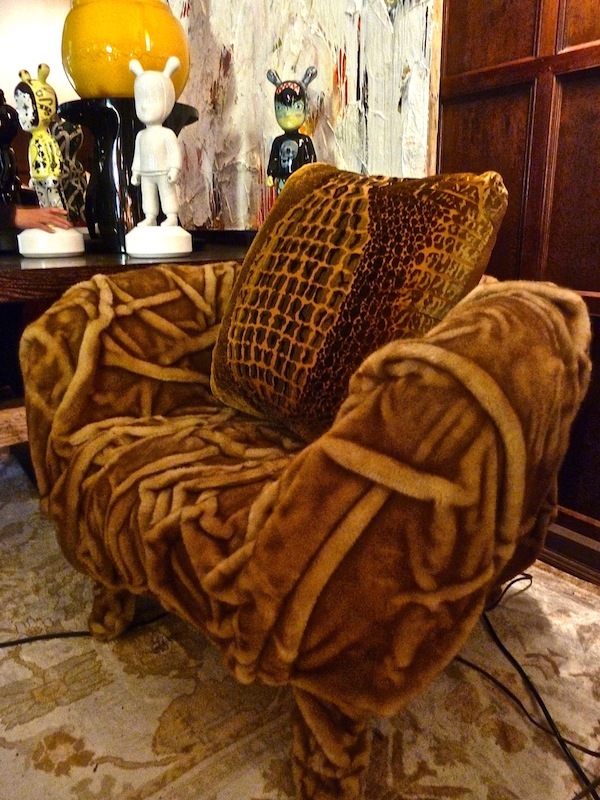 Or perhaps in the lush envelopment of the fur covered Grinza chair? Wood’s amazing space inspires such fantastical musings! An almost other-worldly vignette adds another dimension to the space. Lladró, one of the event sponsors, invites top international artists to collaborate for their Atelier division. The Guest is a character conceived by designer Jaime Hayon and then given distinct personalities by the invited artists. In limited editions, they are handmade and numbered in Valencia. 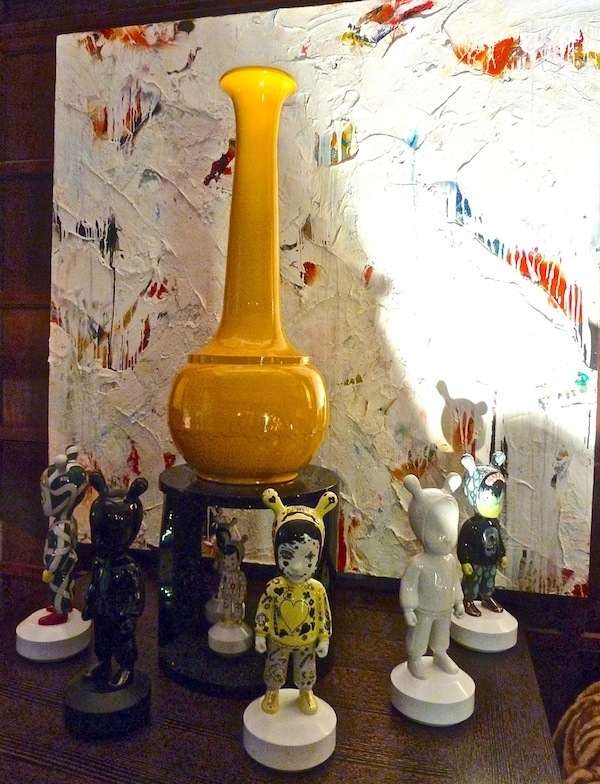 Guarding a colorful John Boone vase and tactile painting by Ron Ehrlich, it is a rather surreal scene. The fireplace is a brooding yet abundant mix of old and new. An eight foot mantel and 19th century Germany terra cotta masks from Newel Antiques set the stage. 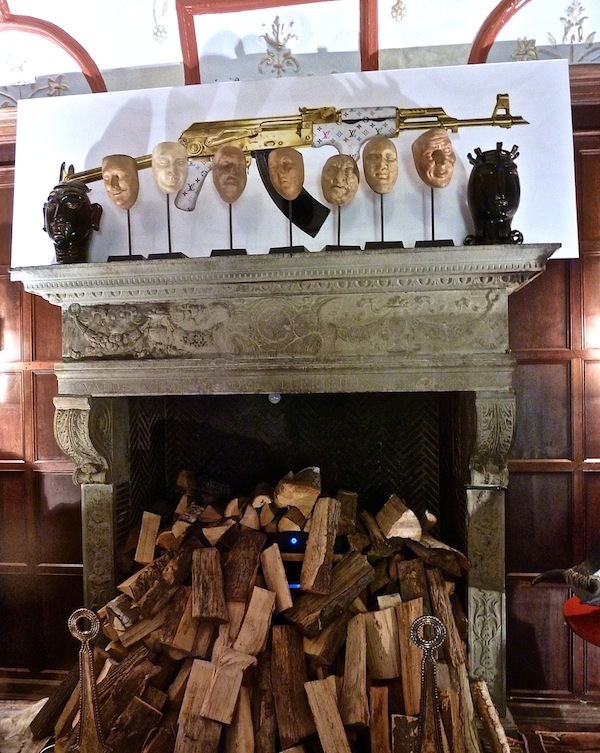 As logs spill out of the hearth with abandon, it’s as if the eyes behind the masks and stylized ceramic covered vases from Daniel Barney are overseeing the scene, warning with the threat of the glamorous Louis Vuitton AK-47 by photographer/digital artist Justin Melnick. Perhaps a loaded message for the partakers of this excessive indulgence? It is very difficult to describe the effect of this large opulent vignette by Inson Wood, below. An impressive orchestration of many moving parts, the room really needs to be seen in person. I encourage you all to experience this elaborate extravaganza, and all the other wonderful rooms in person. I’ll hopefully be sharing a few more here to entice you. Holiday House has extended its venue an extra week and will now be open daily through Sunday, November 25th – plenty of time to get some design inspiration and support a worthy cause. This entry posted in art, design, furniture, holiday, interior design. Entry Tags: Gracie Wallpaper, hermes, Holiday House 2012, Inson Dubois Wood, interior design, Lladro, Newel, Puiforcat, Saint-Louis crystal Bookmark the permalink. Beautiful, Stacey! I love the use of art here. Happy that you have your power back on. My thoughts are with all of those affected by Sandy. Gorgeous, over-the-top room. 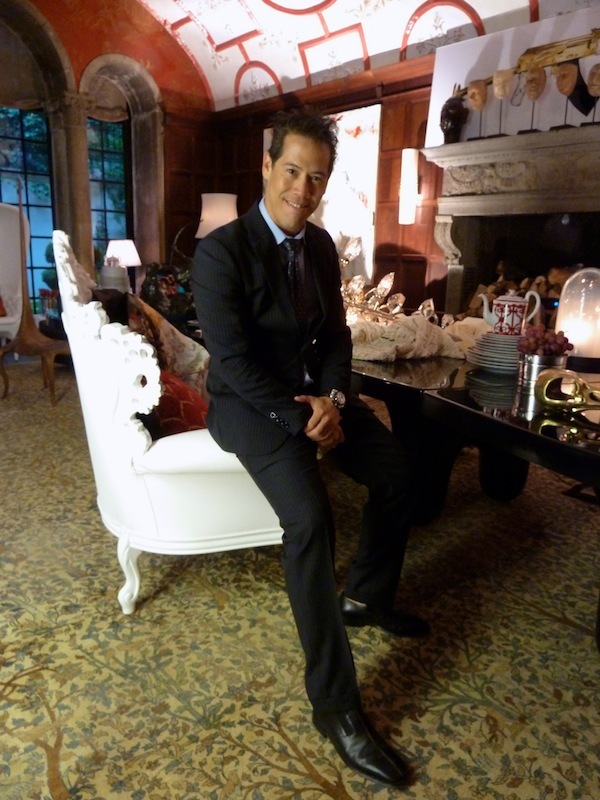 In addition to Daphne and McQueen, I see a lot of Tony Duquette in this room. 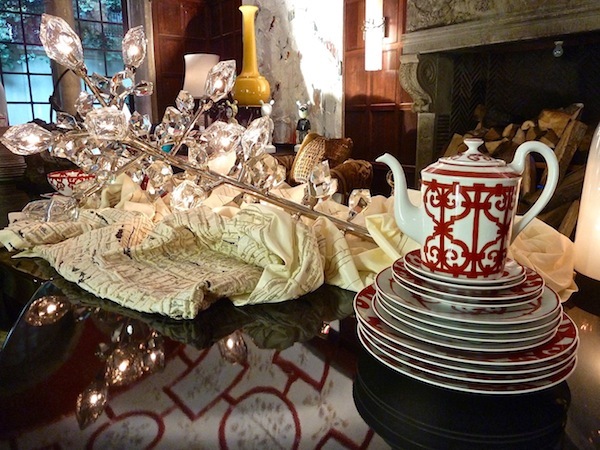 The Chinoiserie details, the Wendell Castle table and the lushness all remind me of Duquette. Are we seeing a return to more sumptuous decorating?? Wow! Like you, wild and chaotic isn’t usually tops for me, but this is incredible. So much to see and all so well-executed. The ceiling has to be my favorite. Happy Monday! Congrats to Inson for another spectacular room. It looks like there are many stories coming from this space and one has to see it in person to fully experience it! I hope to see it myself. Crazy wonderful! I felt like Alice in a very luxurious Wonderland! 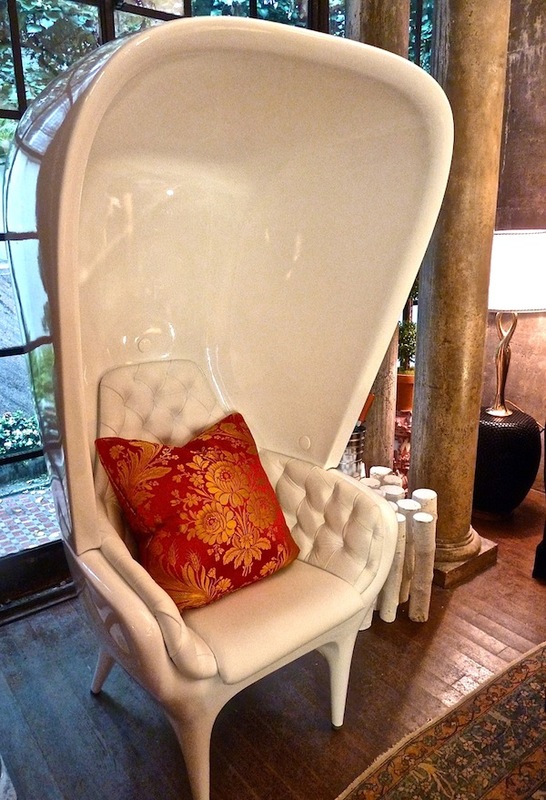 Can picture the mad hatter lounging in the Poltrona Chair! Thanks for pointing out the special touches and for introducing me to the talent of Inson Dubois Wood. Bombastic yet tactile. Velvet urges of majesty succumbing to unapologetic candescence. Inson Dubois Wood never fails to provoke an entropy of synesthesia. 78 queries in 0.611 seconds.